Within the mushroom of development that is northern Oakland County is the Paint Creek Trail, an 8.9-mile rail-trail between Rochester and Lake Orion. For the most part, the trail is a wooded path winding along a trout stream, passing such un-suburban scenery as ponds, grassy meadows, wetlands, even prairie habitat while wildlife such as muskrats, herons, snapping turtles, and an occasional deer can be sighted. But most of all for those walking or jogging along the gravel path, Paint Creek is a quiet escape from the bulldoze mentality of developers who are scraping clean this hilly region north of Detroit and turning it into a land of strip malls and subdivisions. On the weekends, Paint Creek can be a busy trail with a combination of walkers, joggers, mountain bikers, even a few horseback riders. Surveys found that more than 65,000 people use a portion of the trail from May through September and its estimated annual number of users exceeds 100,000. Who says trails aren’t important? Paint Creek Trail begins at the Clinton River Trail as the Rochester River Walk. Within 0.3 mile it becomes Paint Creek Trail in Rochester Municipal Park and in 8.6 miles ends at Atwater Street in Lake Orion. In 1990, the trail was surfaced with crushed limestone, chosen over asphalt to maintain the natural setting. The eight-foot wide, all weather surface makes the rail-trail ideal for hiking, mountain biking, walking, skiing, and horse riding. Wooden bollards are located at trail crossings to prevent vehicles and ATV's from entering the trail. Paint Creek drops 300 feet in elevation between Lake Orion and Clinton River, but in general is an easy hike or walk that can be done in tennis shoes. Most people can cover Paint Creek in three to four hours and, being a point-to-point path, requires two vehicles or some other plan for returning to the trailhead. One of the most scenic segments is the 2.4-mile stretch from Tienken Road to Gallagher Road and Paint Creek Cider Mill, an appropriate place to end a walk. Built in the 1872 by the short-lived Detroit and Bay City Railroad, the route was later used by Michigan Central Railroad later acquired the line and developed the mile-marking system in the late 1890s. Each mile-marker contained the letter “D,” signifying “Detroit,” and a number that represented the distance in miles from the center of Detroit to that Point. These markers are metal, diamond-shaped signs and are found at half-mile intervals along the rail-trail. The railroad’s final owner, Penn Central Line, used the line until 1974 before going bankrupt in 1976. 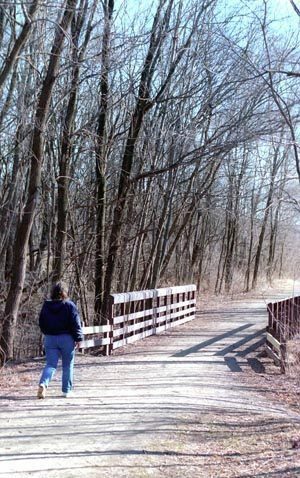 Paint Creek Trail then became the first rail-trail in Michigan after the state purchased in 1983 from for $450,000. In 2006 Paint Creek was designated as a National Recreation Trail. Within 0.3 mile the Rochester River Walk arrives at the north end of Pine Street at the banks of Paint Creek, where it ripples gently through the heart of Rochester Municipal Park. The park is a maze of sidewalks, and the rail-trail follows its northeast side quickly arriving where Ludlow Road crosses the creek. Heading north, the trail quickly crosses the creek again and arrives at a stairway leading into Dinosaur Hill Nature Preserve. Named after a hill that children said looked like a sleeping brontosaurus, this 16-acre preserve is located on the northern edge of Rochester and is bordered on one side by Paint Creek. Along with three self-guided nature trails, Dinosaur Hill (248-656-0999; www.dinosaurhill.org) includes an interpretive center. From Ludlow Road, you follow the trail for half mile before crossing Tienken Road at Mile 1. After switching to the creek's north bank, you gradually leave the sights and sounds of Rochester behind. The sights that remain are of a gurgling trout stream, as you wander through the woods. Within 1.5 miles of Rochester Municipal Park, the trail crosses the creek a second time. Just beyond the bridge are a series of steps leading down to the water; a quiet place to soothe the mind. From the steps you quickly reach Dutton Road at Mile 2.2 where there are bridges crossing the creek on each side of the road. The trail maintains a level and straight course here, and, on the way to Silver Bell Road, crosses the creek twice more. Here and further downstream, annual trout plantings in Paint Creek make it a destination for anglers. Though it's rare to see a fly fisherman here, occasionally you run into an angler who is simply baiting a small hook with a worm and floating it in the current through pools and eddies. Silver Bell Road is reached at Mile 3. On the north side of the road the trail becomes a wide, gravel path that parallels the creek. The stream swings close to the path several times, and in a half mile you come to another set of steps that overlooks an S-bend in the creek. Just before reaching Gallagher Road at Mile 3.7, you will see the site of Paint Creek Cider Mill along the stream. Needham Hemingway built the first mill here in 1835, then dug a raceway a half mile up Paint Creek to power his fifteen-foot water wheel. The original mill was torn down in the 1940s but quickly was replaced and remained a water-powered operation until 1960. Within a short walk from the trail here you can reach both the Paint Creek and the Goodison Cider Mill, as well as the Mill Race Historic Marker. All are located in Goodison, a quaint village of historic homes and buildings. The trail crosses Gunn Road at Mile 4.5 and in another quarter mile crosses a bridge to the creek's east side. After passing half a dozen ponds Adams Road is reached at Mile 6. The trail resumes on the other side as a narrow, dirt path. Within 0.25 mile you pass a sign warning of the approaching Royal Oak Archery Club. The sight of some target bales, no more than fifteen yards away from the trail, has undoubtedly quickened the heartbeat of a few hikers. But any nervousness quickly disappears as the trail approaches its most scenic and isolated section. Less than 0.25 mile from the club, you begin to hear the creek and then see its gently flowing waters. For the next half mile, the trail stays within sight of the creek, which gurgles and sweeps through bends, looking all the world like a blue-ribbon trout stream up north. You have to remind yourself that you're in the fringes of one of the largest metropolitan areas in the country. You cross a bridge to the west side of Paint Creek at Mile 7.3 and soon break out of the hardwood forest at the intersection of Kern and Clarkston roads where nearby is a vault toilet. The trail crosses Clarkston Road high above the creek, evidence of the constant grade you've unknowingly been climbing all day. The trail is now passing through a small parcel of the Bald Mountain Recreation Area, and just beyond Clarkston Road is the last set of stairs down to the water. The last segment of Paint Creek Trail heads northwest into the town of Lake Orion along a very straight route. Along the way, you pass the largest pond of the day. On the fringe of town, the trail uses an old railroad trestle to cross both a road and Paint Creek. Houses quickly pop into view, and the trail ends at a major trailhead with bicycle racks off Atwater Street just east of Lapeer Road (M-24). At a handful of trailheads, facilities include parking lots, vault toilets and bicycle racks. There are no vehicle or entry fees to use the Paint Creek Trail. To pick up the trail in Rochester Municipal Park follow Pine Street north of University Avenue and two blocks west of Main Street (Rochester Road) in downtown Rochester. The northern trailhead is located bear the Atwater Commons Plaza at the corner of M-24 and Atwater Street. Other areas to park and pick up the trail on the north side of Dutton Road (between Livernois and Orion Road), on the south side of Silver Bell Road, on the north side of Gallagher Road, and at the intersection of the Paint Creek Trail and Clarkston and Kern Roads in Orion Township. In Lake Orion there is parking area behind the Kentucky Fried Chicken, near Converse Ct, where the trail is marked with signage. 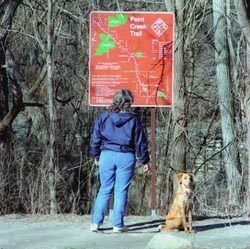 The Paint Creek Trail Office is located at 4480 Orion Road in Rochester at the corner of Gallagher Road where there is a public parking lot for trail users. For information in advance contact the Paint Creek Trailways Commission (248-651-9260).